Author Richie Jean Sherrod Jackson has penned her first book The House by the Side of the Road The Selma Civil Rights Movement which tells the amazing story of how an African American educator’s home became the headquarters for Dr. Martin Luther King, Jr. and the Selma Civil Rights Movement. Her story chronicles a journey from childhood growing up in Alabama during the 1930′s leading up to the 1965 Civil Right’s campaign in Selma, Alabama. 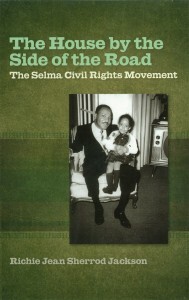 The reader will learn about the history that was made in her home she shared with her husband, Dr. Sullivan Jackson and how together they provided their friend Martin Luther King, Jr. and other key figures of the Selma movement a safe haven during this turbulent time in our country’s history. Read about never before revealed accounts from a woman who witnessed history being made from behind the scenes. The author takes the reader into her home and shares with the world the personal side of leaders who were on the forefront dedicated to peace, nonviolence, justice and equality. Over the years since the Selma movement the author has been featured in numerous television documentaries, books and articles and today her home contains many pieces of original furniture that filled the house during that time. One such historical object is the author’s dining room table which the two first African American Nobel Peace Prize winners sat down to discuss plans for the Selma to Montgomery march. This book was written by an educator to inform the reader about this country’s struggle for voting rights and also help to create a continuing discussion on how a true democracy is dependent on the fundamental right to vote for all it’s citizens. The author also shares a fascinating story of growing up in the racially polarizing South and the amazing journey that lead her to occupy The House By The Side Of The Road.